Your child needs to learn numbers and money. You could sit them down at the table and drill numbers, but what kid whats that? Instead, offer them a toy that gets them to practice those number skills without realizing that’s what they’re doing. Cash register toys are excellent ways for kids to get those math skills early on while having fun. Kids that use dramatic play to learn are more likely to retain that information. Plus, you won’t spend any time arguing with a kid that doesn’t want to be at “school” while they’re home. We’ve compiled a list of our favorite toy cash registers suitable for a range of abilities and ages. We’ve also given you some advice for choosing the right type of register for your child. Let’s take a look. What to Know Before You Buy? Our first register is a brightly colored toy from Little Tykes that helps your child count, identify colors and match shapes. It’s a simple toy that gives children a chance to practice some early math skills while having fun. It comes with nine different coins in three colors. He or she can place the coins in the right slot to “count” and deposit the money into the drawer. There is also a bill toy and a credit card. When you slide the credit card into the slot, it drops coins into the tray. When your child pulls the handle, the drawer opens. Plus, the change dispenser adds a measure of reality to this little cash register. Your child can practice numbers by counting the different pieces of money. He or she also gets to practice color recognition by matching or size recognition. Each of these skills is something he or she will need when school starts, so this toy is a great way to get an early start learning through playing. It’s great for younger children who don’t need toys that are too complicated. It performs some elementary functions, and the accessories are easy for little fingers to grip and manipulate. It doesn’t require any batteries because all the components operate using basic mechanics. Until your toddler gets the hang of things, it might be difficult for him or her to get the coins in the right slot. It also might be difficult for them to fully open the drawer if they don’t get the credit card fully inserted into the slot. However, it’s a suitable way for them to practice fine motor skills. VTech’s cash register is a more interactive toy that comes with a range of accessories. It includes ten pieces of healthy food, a shopping basket, and a pretend credit card. The register is interactive. Inserting the credit card opens the drawer and triggers realistic sounds. It also speaks to your child to help him or her direct play. Your child can learn about healthy foods, practice color recognition, and practice sorting based on color, food type, or some other choices. The register numbers light up and make sounds. They help your child with counting, teach him or her healthy food vocabulary. As your child explores the register, it rewards with different lights and sounds. The scale and rollers provide visual stimulation and interaction through melodies and phrases each time they spin the roller. VTech specializes in highly interactive toys that help your child practice early skills while not feeling like play. It keeps your child’s interest and focus, plus it gives your child a lot of skills they’ll need in school later. It requires two AA batteries to operate. The batteries included are for demo purposes, so the company recommends that you change them as soon as you can. It has the added benefit of teaching your child about food as well as numbers. Funerica’s register package is a full set of toys that includes a register, a shopping basket, play money, a mini play stove and cookware, plus some play food. Some of the food is held together with velcro so your child can cut the pieces in half with a satisfying sound. This set is unique because it includes the shopping aspect of food and the cooking element. Children can pretend to shop, practice money and numbers, making lists, and interacting in a store. Then, they can cook the food they “purchased,” filling out their dramatic play. The food is non-toxic and uses safe dyes. The wood material is a satisfying tactile sensation for kids. The cutting motion offers exciting feedback for kids, and they’ll love the realistic cutting action. The register makes realistic sounds, and your child can make change with the money and the register. It has a working calculator embedded in the register face for added realism. The included microphone works and sounds fun for store announcements and general noises. All of the materials are safe to use and nontoxic. They offer excellent tactile feedback and plenty of sounds and features to keep your child interested. The food and cookware is open-ended play, which is so essential for early development. It’s a durable, but small set, so it won’t require a lot of space to store. Boley Kids’ register is a more realistic register made of durable plastic. It has pleasing colors, and the set includes a solar calculator, a functioning conveyer belt, and a working microphone. Even the grocery scale works just like a real one. It has 19 pieces in total including the register components and play food. This set is suitable for kids getting into dramatic play. Pre-K children especially are looking around and mimicking what they see going on in real life. Dramatic play is essential for children as they develop empathy, emotional intelligence, and critical thinking. The included batteries are for demo purposes. The manufacturer recommends that you change them as soon as you can so that all the features work. It also comes with a few coins, and a pretend credit card. It’s small despite the many different features. The scanner isn’t quite long enough to scan food when it’s on the conveyor, but it isn’t too complicated to bring the food to the scanner. The conveyer sometimes takes a second to start, but it should provide enough motion to be fun for a child. For kids eager to get more involved with money and early math skills, the Learning Resources register is a more detailed activity. It comes with plenty of bills and coins, plus a pretend credit card. The solar-powered calculator helps kids with early math skills and offers a fun, interactive feature that feels real. It comes with 30 pretend bills, 40 pretend coins, a pretend credit card, and an activity book. Each piece of money is realistic looking unlike some of the early learning playsets. The drawer makes a satisfying sound when it opens. The register buttons are large and comfortable to read. They won’t be frustrating for little fingers to manipulate. It’s excellent for practicing counting, sorting, and color recognition. Children can problem solve, measure, and think critically. One useful feature of this register is that it’s great for open-ended play. IT doesn’t talk or give directions. It doesn’t flash or make singing noises. Instead, children have full rein of their imaginations. Open-ended play is vital for that kind of role play and building imagination. The drawer has a potentially sharp edge that can cause some scratches if it opens too quickly. As long as children are aware that this might happen, it should be fine. If your child speaks English, Spanish, or French (or you’re working towards that), Ben Franklin toy’s cash register is a multilingual option for teaching money, math, and dramatic play. It’s a subdued register that mimics the colors of real life registers and is suitable for elementary aged kids. It has working calculator function that adds, subtracts, multiplies, and divides. The machine even says the numbers as your child pushes the button. When you swipe the credit card, it makes sounds, beeps approval, and lights up. The microphone on the side doesn’t just look cool; it works like a real microphone. Inside the drawer, there are different slots for bills and coins. The pack comes with 40 play coins, 25 play bills, and a pretend credit card. The numbers are marked and mimic real bills. They can organize the drawer, calculate totals, and swipe the card. The language function is right on the front. You slide the button to select English, French, or Spanish. If your child is learning, he or she can easily choose which language they’d prefer. It takes three AA batteries, and batteries come included for demo purposes. One exciting feature is that it fits real USD bills, so if your child is practicing with his or her own money, the bills can be stored in the drawer. This is an excellent feature for older children who are learning to spend, save, and count money from allowances, money earned for jobs around the house or given as a gift. Wood offers kids a very pleasing tactile sensation, and wooden toys often become heirlooms. This cash register is a beautiful, simple wooden toy that includes wooden bills, coins, and two wooden credit cards. It doesn’t make any sound or require any batteries. Instead, it’s an open-ended toy that requires your child to use his or her imagination for everything. The wooden drawer slides open to store the bills and coins, the credit card reader is a simple swipe, and the buttons are brightly colored with large numbers. The wooden bills are more durable than paper play money. Little fingers can easily grip them, and you don’t have to worry about creased, crumpled bills frustrating your child. The coins are larger than real coins, but they can still be a choking hazard for babies and toddlers, so be aware. The downside is that it doesn’t feature a working calculator. If you want to practice early math skills, it has to be done the old-fashioned way. The receipt roll has paper on it, and any small roll paper will work once your child has used up all the receipts. The register is very durable and can withstand a lot of enthusiasm from little fingers. It’s great for younger kids and older kids both, but it shines in a household where dramatic play is typical. Sensitive kids will also appreciate that there are no lights or sounds. Another fantastic wooden option is Hape’s register. It’s a brightly colored low tech register that features a drawer that opens and closes, pretend money and credit cards, a scanner, and a card reader. There’s a paper pad located on the front for kids who are practice early math and a simple abacus at the top. Hape’s toys are known for their durability. The company sources materials from responsible places and uses nontoxic dyes and paints for decorations. The colors are eye-catching and help younger kids keep focus without being too obnoxious. It’s big enough to “feel” like a real register without taking up too much space. Plus, the scanner and card reader are attached by strings, so nothing gets lost. It uses paper money, which might not hold up as well for younger children. The drawer is too small for real sized bills, so you’ll have to use the money included or find a similarly sized currency. Sometimes, the money gets stuck behind the upper lip of the register when the drawer closes, but it’s simple to fix by flipping the register over and back to reset the money. This toy is best for pre-K and elementary aged children who have dramatic play stations such as a kitchen area or a grocery area. It fits well with other toys that require a lot of imagination. Plus, the paper pad on the front allows older kids to practice those early math skills by hand, a rarity in the toy world. If you’re building the entire dramatic play scene from scratch, SZJJX’s workshop comes with all the pieces necessary to create a little store. It has a workshop area with storage underneath for food, a register on top, a rack for things “on sale” and a scale. The register features a working calculator and a drawer for storing money. The credit card reader swipes a card, while the scanner lights up. The top of the workstation is perfect for placing groceries, and your child can organize and pack them just like they do a the supermarket. 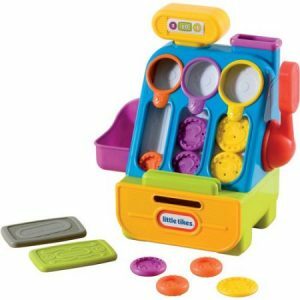 The set comes with play food, money, credit cards, and everything is brightly colored to keep your child’s focus. It measures 20.4 x 9 x 21.6 inches, so it’s best for toddlers and younger children. Older children will find the play station too small. They can practice early math skills, learn about healthy foods, sort based on color and size, and engage in dramatic play. Most of the toy requires your child to use his or her imagination. There’s very little talking or singing. Aside from the lights and the calculator, your child has to supply all of the other actions using imagination only. The plastic is durable but lightweight. It fits well into smaller spaces despite being a full station. The footprint is suitable for houses that need an all in one but don’t have a lot of room to spread out. For older kids who want a full-scale play scene, enter Melissa and Doug. This set includes not only the register, but a conveyor platform, shelves, and a card reader that your child can sign. It comes with a supply of pretend money and a credit card. The conveyer belt turns with the hand crank on the side. The signing pad is similar to drawing pads that use a magnetic stylus to bring the color to the surface. The scanning pad beeps each time something slides by. There’s plenty of space throughout the shelves to store all their play food, so if your child has a collection, it doubles as a convenient shelving system. There’s even a “refrigerator” section at the checkout just like in real stores. It comes flat packed, and the standing product is three feet by four feet. It’s suitable for pre-k aged children and slightly older. It uses realism to make dramatic play more meaningful. Kids can practice real money skills, counting, sorting, and learn about food. It’s good for multiple children to play with as well. It doesn’t come with any play food, so you’ll have to invest in extras if your child doesn’t have any. It’s best for children who already have a set of play food and are looking for something more elaborate to add to their collection. Again, it offers so much storage, so it’s a good investment for kids who have overflowing play food (or other toy) collections. Buying a register is simple, right? It’s not quite that simple. There are a few things to keep in mind when purchasing a play register. With most toys, age is an essential factor to consider. Registers often come with accessories that can be choking hazards or at the very least, frustrating for little fingers. They also have some functions that younger kids won’t understand or use. Toddlers need a durable toy that contains no small parts. Some wooden registers come with wooden money, bills that are thin wooden pieces and won’t get crumpled or lost. The coins are larger and less likely to choke. They have essential functions such as a drawer that opens and closes. Plastic machines might not have durable money, but some of them offer younger kids visual and auditory stimulation such as songs and speaking numbers. These are good for kids that need to practice very early math skills, but make sure that the features are straightforward. After toddler years, kids are more into mimicking what they see in real life. Role-playing is an essential part of their development. They can develop social skills and problem-solve through taking on the guise of someone else. They’re ready for more elaborate machines. Many registers for this age have working calculators so kids can add and subtract. They also have realistic functions like beeping scanners, and drawers that respond to commands on the keyboard. They’re better able to handle paper money and small accessories. At this age, they begin to be aware of value and numbers, so play cash is an excellent way to work on math literacy through play. It’s even better if the money looks like real money for financial awareness as well. Elementary kids are ready for machines that offer a full spectrum of features. They’re practicing math in school, and they’re likely earning their own money through chores or an allowance. Cash registers that operate like a real bank are excellent for helping them keep up with the money that they’ve earned. However, don’t think that elementary kids only benefit from fancy machines that talk. They can be just as pleased with simple wooden toys that give them the full spectrum of imagination. Even at this age, dramatic play is critical, so simple toys provide them with the chance to practice those skills. It’s best to consider the personality of your child to decide if they’d benefit from full interactive toys or something simple. If they show a lot of imagination and willingness to take charge of their play, something simple might be the best choice. If you’re looking for them to learn specific things, interactive toys give them more direction. Wood versus plastic is an old argument. Plastic catches a lot of negative feelings, but the reality is that both types of materials have good and bad points. Plastic is excellent for weight and interactive features. Most toys that take batteries and have working lights and sounds are made of plastic. It’s a lightweight material and less likely to cause injury if your child is playing rough. It has a better price point than wood, as well. The downside is that plastic isn’t as durable as wood. Plastic toys aren’t going to become family heirlooms, and they might not even last long enough to pass down to a second child. They can be toxic, so be sure to check what kind of plastic the company uses. Wood is often sustainably and responsibly sourced. It offers a pleasing tactile sensation for kids and is extremely durable. Wooden toys are frequently beautiful and last not just through siblings but several generations of kids. Wood is heavy, however. If your child has ever chucked a wooden toy at you, you know how much it hurts. It’s also less likely to be a material for interactive toys, so you won’t get realistic lights or sounds with most wooden models. It’s also more expensive than plastic. At the very least, cash registers should come with some play money intended to fit into the drawer. They don’t all fit the same size play money, but you shouldn’t have to worry about buying your own. If it doesn’t come with play cash, we wouldn’t recommend investing in that model. There are other accessories to consider. Many models now include a credit card accessory, including the card itself, the card reader, or a scanner. You can decide if this bit of realia is necessary. Some registers come with other extras like play food, baskets, scales, and conveyor belts for a full-scale grocery option. One upside to these types of sets is that you can build an entire dramatic play station for your child. Some even offer extra storage through store shelving and displays. They have larger footprints but are a storage feature and not just a toy. Toy registers are great ways for kids to practice early math and financial literacy. They learn without even realizing they are, which is the best type of play. The social benefits of engaging in dramatic play are excellent, as well. What stage of life is your child in right now? Are they ready for fully interactive registers or are you aiming for something simple? Let us know in the comments below.